Whoa. Listen up folks. You're going to need this book. I was hooked from the very first page and I was glued to whole story. I had every emotion available coursing through my body and I just couldn't get enough. Nastya doesn't speak. I knew something horrific had happened to her and I couldn't wait to find out. Damaged girl needs saving. Shows up in boys garage and watches him build stuff. Boy also needs saving. They are the story of thinking she is unlovable and he believing everything he loves dies. Totally tragic and gut wrenching. I wanted them to love each other. I wanted them to be loved by each other. I wanted them to know they were each other's savior. The whole thing was brilliant. It has been a long time since I've read a tragic story that I didn't feel bogged down by. It was heart warming and I so want there to be another book. 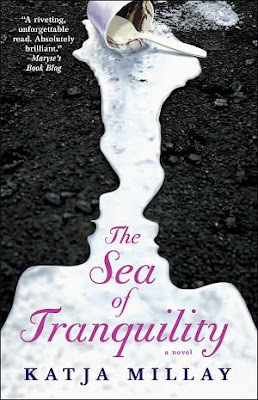 Put The Sea of Tranquility on your radar people. It needs to be at the top of the list. I kept seeing this on Netgalley and wondering if it was something I really wanted to read or not. But now? I'm sort of regretting not requesting it... I'll have to keep my eyes open. Oh, it is a must read Jac. Totally worth the hype and it is just a different story line. These types of plots have a tendency to get all depressing but The Sea of Tranquility doesn't get you all bogged down by it all. It is a nice balance of the hardships and the blessings. And the ROMANCE! Totally brill! The writing was beautiful. This review is written in such way that I just cannot miss this book! you mustn't! It needs to be on your TBR pile. I loved this one too, so glad you enjoyed it and are spreading the word! This needs to be on people's radar! It is that good. You must read it asap! !